West Sussex is our home and a beautiful county, enhanced by countless miles of ancient hedgerows and thousands of majestic Sussex Oaks. We also have our fair share of ancient woodland and bluebell woods to brighten up any spring day. That's why, as qualified tree surgeons in West Sussex, we want to help keep our county glorious and protect our precious trees for generations to come. Huge numbers of mature oak trees in Sussex were cut down for the First World War effort, leaving only younger trees standing. But 100 years have now passed and those that remained are now mature in their own right. But that is the reason you don't see many really ancient oaks in the county. 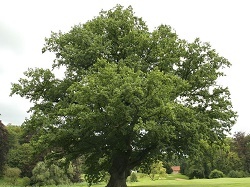 Many oak trees stand in gardens and they do need attention from time to time. That's where Horsham Tree Surgeons can help to tidy up and prune your mighty oaks, as well as the smaller trees that grow in the typical town garden. There are many other types of tree in Sussex of course, including a few enormous speciments of the Giant Sequoia redwood trees imported by the Victorians and now dominating the skyline in some historic gardens. But Sussex is known for its oak trees and certainly wouldn't be the same without them. Whether you need full-scale Sussex tree surgery or just some judicious trimming, we can help you keep all your trees in prime condition. Just call us and we'll come out to give you some free advice.